With over 40 years of experience in sales, marketing, warehousing, fulfillment and distribution, Marlee Enterprises provides your business with personalized care and a multitude of services. Our services consist of all steps from initial branding design work to the manufacturing of final products. In addition, we offer warehousing, distribution and fulfillment for all size businesses and projects. We take pride in making ourselves easily accessible to our clients through direct communication and immediate response. We respond within hours, not days. 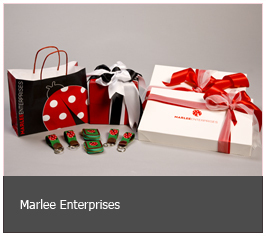 special offers from Marlee Enterprises. Marlee Enterprises is a complete, one stop shopping firm providing businesses industrial products,unique packaging materials, warehouse supplies, and earth-friendly janitorial supplies. Concurrent with our target to market and sell the above, Marlee Enterprises also offers a wide range of promotional items to suit the needs of our customers. Marlee Enterprises has developed a widely diversified inventory of the above-mentioned products. These products are sourced through factory direct, master distributors, and manufacturing representatives. This enables us to get the products to our customers extremely fast and at the lowest price possible. Marlee Enterprises maintains our own warehouse facility and this allows us to service our customers on a JIT (just in time) basis. Businesses currently using our services and facilities are: Estee Lauder, Claire’s Stores Inc., Bluegrass Cooperage, Origins, Aveda, Wakefern (Shoprite), J Mclaughlin, Tag Heuer, Terra Momo, MAC Cosmetics, DKNY Retail, Ghurka Leathers, Lenox China, Terracycle, and many other fortune 1000 companies. Marlee Enterprises is a privately held "S" Corporation formed in the State of New Jersey and it is one hundred percent owned by Marjorie Feniello. The company was founded in 1989 with its first services launched to the cosmetic industry. Today we service over 100 accounts in 21 states, as well as Canada, Europe, Asia, and the Middle East.